As a result of our display at the ICGA convention, we were asked to write an article for The Carnival Pump. We appreciate the interest shown in our display. We enjoyed putting it together and learned a lot of interesting things about the making of Fern Brand Chocolates. 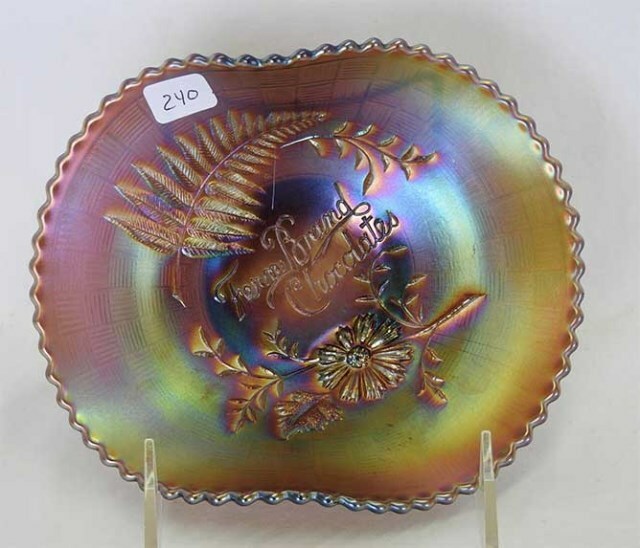 The little amethyst plates are approximately six and one-half inches in diameter and are made in three shapes – flat, hand grip, and turned up on two sides. They have a fern, the words Fern Brand Chocolates and a flower molded on the front of the plate with the basketweave on the back and the “N” impressed in the center. 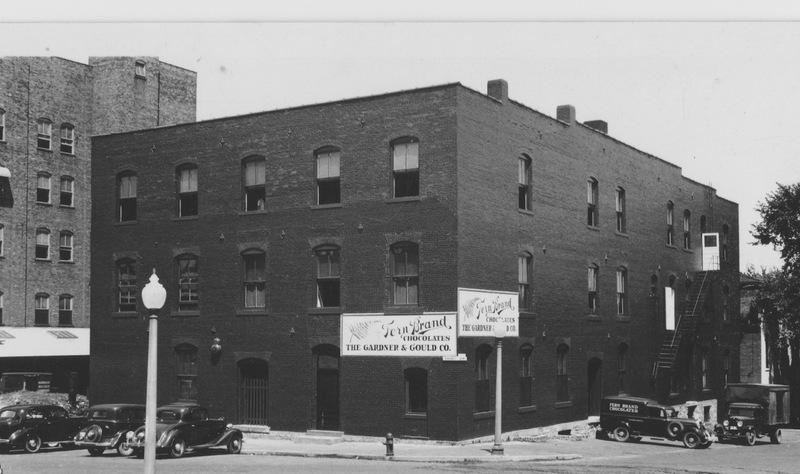 This was what the Gardner and Gould building looked like in 1939. If you have the privilege of owning a Fern Brand Chocolate advertising plate, we thought it might be of interest to you to know that it was made by the Northwood Company especially for the Gardner and Gould Company in Burlington, Iowa. The building, from where these plates were distributed and the chocolates were made, still stands at the corner of Elm and Third Street, just a couple of blocks from the Mississippi River and is now occupied by the Burlington Tent and Awning Company. This is a two-sides-up or double handgrip Fern Brand Chocolates piece. The company was in operation from June 1900 until July 1955. It was during the Pre-World War I period that the plates were given to merchants as a token of appreciation for promoting their chocolates. One plate was carefully wrapped and packed on top of each large wooden crate full of bulk chocolates and shipped to fill orders all over the U.S. Since their chocolates contained no additives or preservatives, and there was very little refrigeration during the early days of the company, weather was the determining factor in when shipments would be made. Their goal was to be able to make and ship chocolates from October until Mother’s Day. This is pencil marked as being 5 lbs. and would most likely have been the box that contained the plates that were sent to retailers. Due to the large number of out-of-town orders and because local merchants picked up their bulk chocolates in cardboard boxes rather than crates, it was suggested by the late president of the company that many more plates were distributed nationwide rather than locally. We purchased our first plate from Bill Crowl at the ICGA convention in Columbus, Ohio in 1974. He had purchased it from a dealer in New York – so we brought it back home. 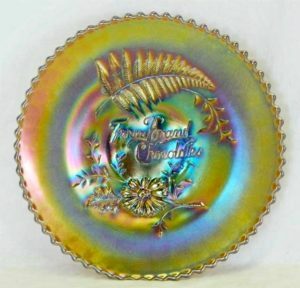 When visiting with the late Mr. Henry Raff, the president of the company at the time it was sold, I showed him our plate. He wasn’t very impressed, however, and said that it reminded him of “the ugly green bowl” that was always on the president’s desk filled with paper clips, etc. He said it was there the day he sold the company, and as he walked out of his office, he threw his keys in the bowl. When asked if it was a carnival glass bowl, he said, “no, it wasn’t like yours, it had the same inscription but it was green.” He thought because it was green, it wasn’t carnival! We were left wondering if maybe the Northwood company made a “one of a kind” bowl especially for the desk of the president and sent it along with the hundreds of little plates they had ordered. At any rate, we’re keeping our eyes open and will always be on the lookout for “that ugly green bowl”! 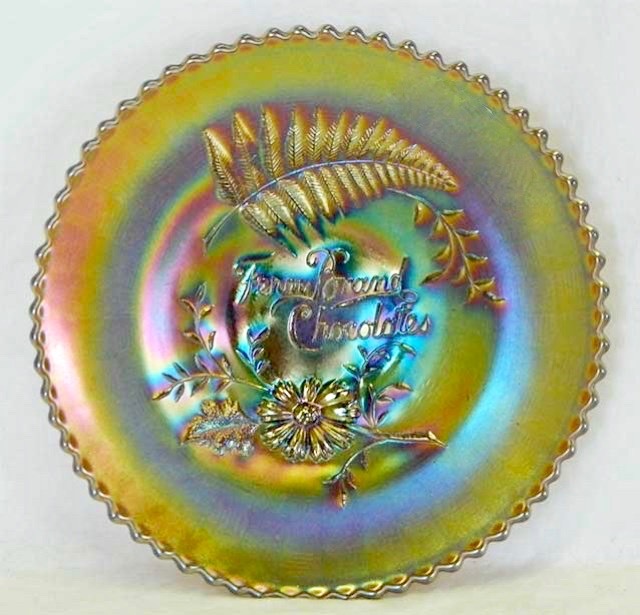 Perhaps this Fern Brand Chocolates plate appeared green to Mr.Raff. 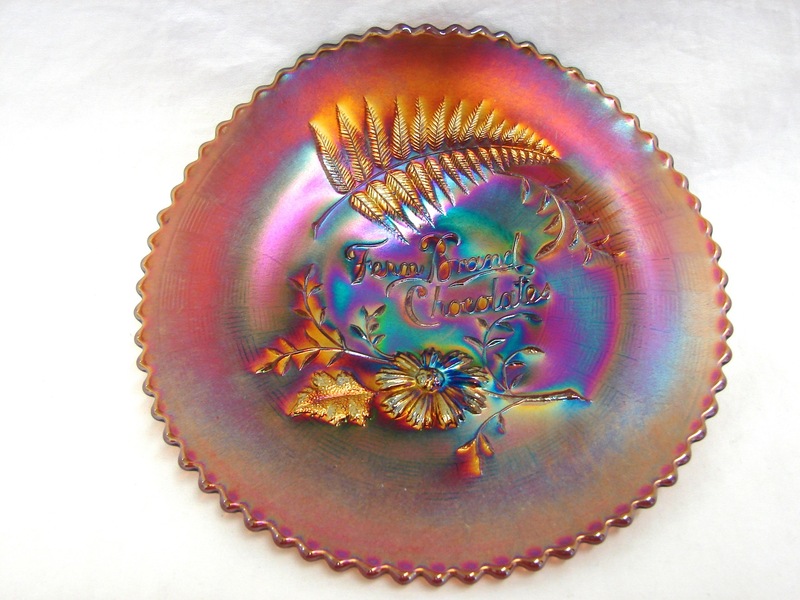 As a result of our search into the history of the Gardner and Gould Co. and the memorabilia regarding Fern Brand Chocolates, we developed a great appreciation for the Fern Brand Chocolate plate, and we hope that many others will find pleasure in adding one to their collection. This is the single handgrip plate. You can see that the one edge was turned up at the time of manufacturing while the glass was still semi-molten.